Dispatch from New Jersey: Town Hall and Legislative Visits! In an effort to get the local South Asian community engaged around immigration reform, SAALT-NJ, along with community partners, held a ‘Town Hall for South Asians on Immigration & Civil Rights’ in Jersey City on July 27th at the Five Corners Library. The event, part of the One Community United campaign, was the second in a series of community forums that will be held nationwide as a part of the campaign. The town hall brought together not only a diverse group of folks within the community, but also a diverse coalition of local community partners, including: American Friends Service Committee, Andolan, Asian American Legal Defense and Education Fund, the Council on American-Islamic Relations (CAIR-NJ), Govinda Sanskar Temple, Manavi, New Jersey Immigrant Policy Network, and the Sikh Coalition. Although the focus of the discussion at large was around immigration reform, the conversation covered a variety of issues, such as the effects of visa limitations and backlogs on low-income workers and women facing violence in the home; and detention centers and the growing number of detained immigrants. The conversation was at once challenging and emotional, as participants shared personal stories illustrating how immigration laws have negatively impacted their lives and the lives of their loved ones. Nevertheless, the conversation ended on a positive note with ways to stay involved with the campaign, and to get more civically engaged around the immigration reform conversation. In fact, on August 19th, SAALT members, along with coalition members from NJIPN and New Labor, conducted an in-district meeting with Representative Donald Payne’s office in Newark, New Jersey. Participants met with a senior staff member at the Representative’s office to discuss issues around immigration and healthcare reform. 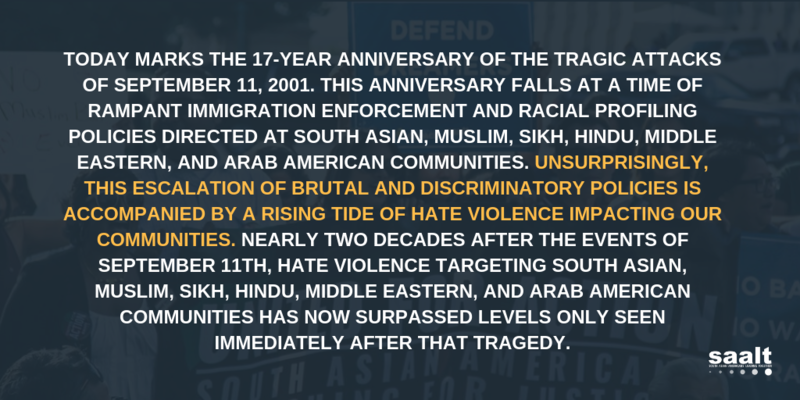 The delegation highlighted key concerns to both the South Asian community and the immigrant community at large, such as (1) the increase in detention and deportations post 9-11 and its impact on immigrant families in the US; (2) family- and employment-based visa backlogs and the need for just and humane immigration reform to prevent families from being torn apart in the process; and (3) more concrete measures in place for immigrant integration to address issues such as linguistic and cultural barriers in accessing services, and, as a result, becoming active and participating members of the community. The meeting was a great experience – it illustrated to the members present the significance of civic engagement, and how important it is to reach out to our respective representatives about issues concerning us. In a political and economic climate that seems so anti-immigrant, it was certainly refreshing to be able to sit down with the Representative’s office to actively advocate for issues that deeply impact the immigrant community. I look forward to meeting with other local offices in the coming month and encourage others to try to schedule meetings with your respective Representatives while they are home for August recess. • Call your member of Congress to express your support for immigration reform and strong civil rights policies. Find out who your member of Congress is by visiting www.house.gov and www.senate.gov. • The Campaign to Reform Immigration for America has launched a text messaging campaign that sends alerts to participants when a call to action, such as calling your Congressman/woman, is urgently needed. To receive text message alerts, simply text ‘justice’ to 69866. • Stay in touch with local and national organizations that work with the South Asian community. • Share your immigration or civil rights story with SAALT by filling out this form or sending an email to saalt@saalt.org.